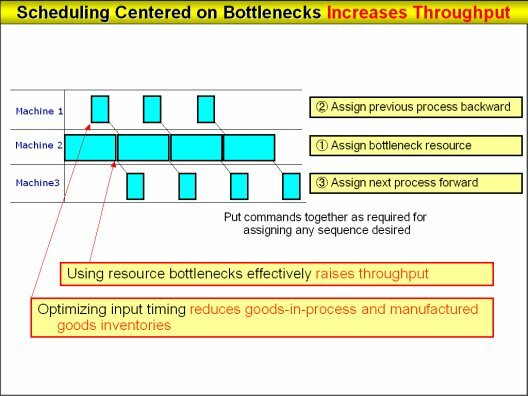 Q: The TOC (Theory of Constraints) tells us that allocating bottleneck (restrictive) resources first will maximize the operational efficiency of bottleneck resources, and increase a plant's overall throughput. But how in specific terms does that happen? A: TOC says that if we improve the bottlenecks when we arrive at the biggest bottleneck, the throughput will be enlarged. In the diagram below, machine 2 is a bottleneck resource. We first allocate machine 2 in the scheduling sequence. We then allocate machine 2's preprocessing backwards and its post-processing forwards. 1) Improving the rate of operating efficiency of bottleneck resources and maximizing throughput for the entire plant. 2) Synchronizing the arrival of the first process with bottleneck resources and preventing an excess goods-in-progress inventory prior to bottleneck resources because the result show that arrival is too quick. 3) Smooth the flow for subsequent processes after the bottleneck process to reduce the work in progress inventory. Advanced Planning and Scheduling System is called TOC according to planning parameters and allows simple scheduling centered on bottlenecks.